Posh manager Grant McCann applauds the home fans after a 2-1 win over Plymouth. Photo: Joe Dent/theposh.com. 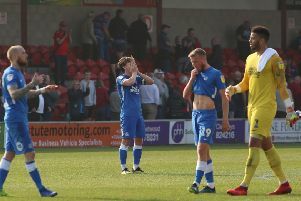 Manager Grant McCann felt his Peterborough United side deserved their 2-1 opening day win over Plymouth at the ABAX Stadium (August 5). Goals from Plymouth defender Gary Sawyer, who deflected a cross from Leo Da Silva Lopes into his own net, and striker Junior Morias gave Posh the perfect start to their League One campaign. Posh wing-back Gwion Edwards shoots at the Plymouth goal. Photo: Joe Dent/theposh.com. Plymouth substitute Gregg Wylde pulled a goal back for Plymouth, but Posh held firm in a somewhat nervy finale. “We deserved to win after standing strong against a very good team who are used to winning,” McCann stated. “We made it hard for ourselves by not scoring a third goal when we were well on top. Marcus Maddison, Michael Doughty and Jack Marriott should all have scored to make the game dead and buried, but I was always confident the character and spirit in my side would make sure Plymouth couldn’t score a second goal. “We were worth the three points. We played some good stuff at times. Marriott and Maddison made runs off the back of midfielders they couldn’t cope with. Posh striker Junior Morias celebrates his goal against Plymouth with manager Grant McCann. Photo: Joe Dent/theposh.com. “Plymouth had chances and my goalkeeper has played very well, but their goalkeeper also made some great saves in the second-half. “We weathered a bit of a storm, but I felt we were the better team. Plymouth manager Derek Adams was unhappy the second Posh goal was allowed to stand by referee John Busby, claiming Marriott had tripped Sonny Bradley in the build-up. But McCann predictably had different opinions. “I will not get into a slanging match with a manager I rate and respect very highly,” McCann added. “I watched the incident with Jack and Sonny Bradley back and any contact was minimal. I possibly would have wanted a free kick if the boot had been on the other foot, but referees have a hard job. Posh are next in action at home to League Two side Barnet in the first round of the Carabao Cup on Tuesday (August 8).